Ahmed Abdul-Malik (bass), Ed Thigpen (drums). Whether by accident or design, Avid’s compilation of single discs by four different pianists has a striking pattern to it. 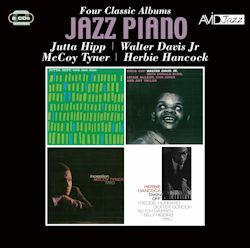 In three cases – those of Walter Davis Jr., McCoy Tyner and Herbie Hancock – the pianists are represented by the first recording each made as a leader. In the remaining case – that of Jutta Hipp – the pianist is represented by her last recording of any kind! Jutta Hipp, born in Leipzig in 1925, began to make a musical reputation in the years after the war and by the first half of the 1950s (then largely based in Frankfurt) she was playing in, for example the band of saxophonist Hans Koller, and leading groups of her own. In 1955 she moved to the USA and in the following year, having obtained a work permit and a cabaret card, she began to work in New York, largely with a trio which included British-born bassist Peter Ind and drummer Ed Thigpen. Two albums by that trio – Jutta Hipp at the Hickory House, I & II were issued in 1956. So too was the album reissued here. Within two years of its recording and issue, Hipp (who had always suffered badly from stage-fright) had retired from performance. She remained in New York until her death in April 2003, supporting herself as a painter and by work in the clothing industry. On Jutta Hipp with Zoot Sims she demonstrates an assured fluency in the prevailing style of modern jazz piano – she had obviously listened to both Horace Silver and Wynton Kelly (as well as earlier bop pianists), for example. Her work is assured and fluent, without being notably distinctive; Zoot Sims largely ‘steals’ this album, playing throughout with emotional warmth and technical fluency – and, as it almost goes without saying where Sims is concerned – he plays with an unfailing sense of swing. His ballad playing on ‘Violets’ is a model of its kind, ably accompanied by Hipp (as well as Abdul-Malik and Thigpen). On ‘Down Home’ Sims fuses earthiness with harmonic sophistication, and ‘These Foolish Things’ displays both Hipp and Sims at something like their best. Only trumpeter Jerry Lloyd disappoints, his playing often being diffident and awkward. Overall this is an engaging album of jazz which isn’t usefully characterized as either ‘cool’ or ‘hard bop’ and yet seems to typify its time. Davis Cup is very definitely hard bop. Indeed, it is a minor masterpiece of the genre and, like so mush of what Davis (1932-1990) did, it seems to have gone curiously under-appreciated. All the tunes are by Davis and all have real musical substance – not one of them feels like a piece hurriedly prepared for a recording session. Donald Byrd made a huge number of recordings around this time and on a good many of them he sounds rather disengaged, playing, at best, in rather routine fashion. But here his interest in proceedings is very apparent and he plays with genuine commitment and inventiveness. Jackie McLean plays with his usual passion and urgency and, like Byrd, evidently enjoyed Davis’ compositions. Sam Jones and Art Taylor make a forcefully supportive team and get the best out of the front line – including the leader. Davis is an intelligently quirky soloist (though owing something to Silver and to Monk). The quality of the whole session is such that it is nothing less than disgraceful that Davis had no opportunity to lead a recording session again until Night Song in 1979 (issued by Denon). Of his later recordings, In Walked Thelonious (1987) and Scorpio Rising (issued in 1994) are well worth hunting for. Davis’ debut as a leader was not, then, the beginning of a long career of further recordings under his own name, whereas the debuts of McCoy Tyner and Herbie Hancock were very successful announcements of what were to be much lauded careers. In truth, though, by the time Tyner recorded the music on Inception he had already occupied the piano chair in the John Coltrane Quartet for a couple of years and therefore had quite a high profile in the jazz world. In Art Davis and Elvin Jones, he chose to work with two other musicians who had likewise worked with Coltrane. Inception is an impressive album, with a sense of space and air unlike both Tyner’s work with Coltrane and many of his post-Coltrane recordings as a leader. It does, though, have the kinds of insistent momentum one associates with later Tyner. On the whole, however, his touch here is lighter and less percussive than it was to become, with more memories of bebop pianism evident. I am inclined find this early recording in some ways more attractive than the famous later recordings. While it lacks the sweeping piano-as-orchestra style (which can sometimes lead to a kind of spurious grandiosity) of those later recordings, the music here has a compensatory lyricism and a some attractive single-note runs. Art Davis and Elvin Jones are exemplary, supportive in a hard-driving fashion without ever inhibiting the flow of Tyner’s ideas. On ‘There is No Greater Love’ Tyner plays with striking melodic invention and variation, interacting brilliantly with Davis and Jones. Some of the denser chords in ‘Blues for Gwen’ sound, now, like anticipations of the later Tyner. I am (just!) old enough to remember the considerable impact which Herbie Hancock’s debut as a leader – Takin’ Off – had when released by Blue Note in 1962. Blue Note obviously realized they had a substantial musical figure on their hands, giving him the budget to record as leader of a quintet rather than a trio. Already harmonically adventurous as a pianist; already sophisticated as a composer and arranger; already able both to work within the hard bop conventions and to innovate, it was obvious that here was a major figure in the making. The whole album is made up of originals by Hancock, one of which – ‘Watermelon Man’ – was to become a ‘hit’ (insofar as modern jazz goes in for such things). Like Tyner, Hancock had already made something of a name for himself, having worked with leaders such as Donald Byrd and with no less a figure than Coleman Hawkins. Before long – and perhaps in large part because of Takin’ Off – he was to join Miles Davis. Leaving aside all that Hancock would go on to do, it should be stressed that this album is far more than just a ‘pledge’ of future achievements; Takin’ Off was, and remains, a considerable achievement in itself, a recording of lasting value. A final thought: while it would be wrongheaded to claim that Walter Davis Jr. was a musician of the same stature as Tyner and Hancock, the gap between his abilities and theirs was not so great as the subsequent reputations of the three pianists seems to suggest. Life is, indeed, not ‘fair’ and perhaps that is particularly true of the ‘Jazz Life’.